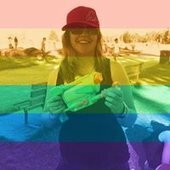 Please post any data issues related to Australia here. 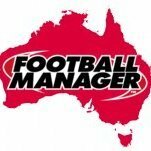 Please note that any non-data issues for Australia should be posted in the appropriate thread within the League Specific Issues Forum. This would include issues such as league scheduling and league rules. Understandable why last two maybe missing as they only signed 2 days ago, but Mani should have been added as he signed a week ago. Also The name of the Stadium is NOT the Wellington Regional Stadium, has not been for many many years and is named the Westpac Stadium through naming rights! Please fix this for this edition of FM. Marcelo Carrusca is still contracted to Western Sydney Wanderers in game until the end of the 2018/2019 season, in reality he has been released by the club the end of the 2017/18 season and is now a free agent. Unfortunately I can't seem to find an official announcement but there's this article https://www.adelaidenow.com.au/sport/adelaide-united-fans-favourite-marcelo-carrusca-is-considering-playing-npl-in-sa/news-story/ddadfb6f067261cc4c869b6e51e63d04 and I'm sure the club could be contacted to verify this info. 2 Determination for Josh Risdon seems extremely low, considering he's the Socceroos first choice RB. Tate Russell is a right fullback, not midfielder. This might be a small issue that the history of the all of the NPL clubs stops at the 2013-14 season instead of being the 2017-18 season as of the start of the game. Hey Guys, Nicolas Sette is a senior member of Victory now, also plays as a winger. Birkan Kirdar also has signed a full time contract. Dimitri Petratos (Newcastle Jets) had a very strong last season and his stats do not reflect both that and his Australian callups. North Launceston Eagles are not in the database in the Tasmanian Northern League. While Beachside FC and Hobart United aren't in the database and they compete in the Tasmanian Southern League. The league rules for the A-league are incorrect. You are allowed 5 foreigners of any nationality where in the game it has max 4 and allowed 1 Asian player. Ritchie de laet is not listed as a designated player so his 15k wage impacts the salary cap taking you over the cap, also the correct term is marquee not designated. Nathaniel Atkinson plays right back but is listed as a right midfielder and central midfielder in the game. Gediminas Krusa (Devonport City) -- Left the club towards the end of the 2018 season (https://www.theadvocate.com.au/story/5593465/strikers-import-shown-the-door/). He managed 18 league appearances in 2018 (http://websites.sportstg.com/team_info.cgi?action=PSTATS&amp;pID=204297438&amp;client=1-8296-120732-477358-26137297). Jakob Cole (Olympia Warriors) -- Was back playing for Cooma Tigers in NPL Capital Football in 2018. 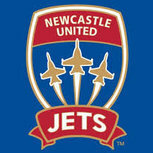 (http://websites.sportstg.com/team_info.cgi?action=PSTATS&amp;pID=197906218&amp;client=1-10181-151052-401037-20416972). Played some games for Olympia in 2017. Nick Meredith (Olympia Warriors) -- Retired. Played socially in 2018 (http://websites.sportstg.com/team_info.cgi?action=PSTATS&amp;pID=193861341&amp;client=1-8296-120700-320256-21288517). The current FM database lacks consistency at the second tier of Tasmanian football. In the south 4/8 clubs are in the database. Missing are Beachside FC, Southern FC, Hobart United and Nelson Eastern Suburbs United. (http://websites.sportstg.com/comp_info.cgi?c=1-8296-120731-471029-0) In the north all but North Launceston Eagles FC is in the database. One of the teams listed in the northern comp is not in it: Prospect Knights. (http://websites.sportstg.com/comp_info.cgi?a=LADDER&amp;compID=481044&amp;c=1-8296-0-0-0). FM calls the second tier leagues "Tasmanian Northern Premier League" and the "Tasmanian Southern Premier League". They are acutally the Northern Championship and Southern Championship respectively. There is a "club" listed in the database called Tasmania NTC. The NTC program in Tasmania hasn't been run for a couple of years now. He is now a RB not a RW. I know this is a massive list but thanks to anyone that enacts this stuff. The editing could be worse for the A-League but it's yet another year where the team is clearly undermanned, here are my fixes for the database. All of these suggestions are pretty clear and should be obvious to watchers of the league. George Blackwood – Second position should be LW, remove CM from his positions. Jordan Elsey – In the youth team for some reason, will be the starting CB and needs a big boost. Heading from 10 to 14, tackling and marking both 13, strength 13 to 15, he needs to be a better player than Regan basically. Michael Marrone – Could receive a slight downgrade due to age and as Strain has taken preference over him. Daniel Margush – One of Australia’s best young keepers, should be in the Australia u23s squad so ability upgrade. Needs to be better playing out from the back. Tom Hiariej – Shouldn’t be a CB at all, please remove that, should be more capable of playing CM. Crossing should be 14, excellent at putting the ball in the area. Tommy Oar – Should be less capable of playing LB (he was more of a LWB) and accomplished at CAM. Nathaniel Atkinson – It’s crazy that he can’t even play RB, needs to be natural there and less so as a winger and CM, could have a potential boost too. Lachlan Wales – Needs at least 14 pace and acceleration, minimum 13 free kick taking and in general more ability. Thomas Deng – Somehow is in the youth squad despite making his Socceroos debut, needs a big upgrade and should be better than Ansell. As a smaller centreback he is quite fast and agile, should have 15 for pace and acceleration, 13 for agility and balance. He needs to be more capable at crossing, dribbling and passing as he’s also excellent at full back. Awer Mabil should be a friend. Jason Hoffman – Should be able to play in all right sided positions, spent a lot of time at RM last season. Small upgrade to finishing from 9 to 11 and first touch 8 to 10 as he is a good target man while playing striker. Lachlan Jackson – Needs downgrade to physical stats, he should have lower acceleration, pace, agility and stamina. Brendon Santalab – At 35 years of age Santa shouldn’t have 14 acceleration and 14 pace, 10 would be better. Jacob Italiano – One of Australia’s brightest young wingers, not sure on his potential but I’d say at least -7.5, he should be a Gladbach player who is loaned back to Perth until the end of the season. Should be LW not ST with good dribbiling, agility and first touch. Make sure you get this guy right. Jop van der Linden – Has always been a CB, should only be competent at left back. Sarpreet Singh – Should be more of a LW and CAM not CM, otherwise looks good! Isias - is eligible for Australia but ingame has him listed for eligibility in 5 years? Chris Harold - Has been a solid a-league player for years, technicals should be better than they are. Feel free to adjust him as you see fit - but he should hold some possibilities to play CB. DMC should be his natural position - but he can play at any back position if this is ultimately required and has done so in the past. Ah, missed that. Sorry, rest should be accurate though! Unable to register players from the default Sydney FC Squad. With these errors, the order really shouldn't be like this as Melbourne Victory and Sydney FC should be dominating the league as they are in real life. Also, Wellington Phoenix (which should be the name, not Phoenix as its shows here) should not be this strong in the A-League as they haven't made the finals for three seasons now. With these errors, the order really shouldn't be like this as Melbourne Victory and Sydney FC should be dominating the league as they are in real life. Were you controlling the Phoenix, or is their team just way too strong? They have the weakest squad in the league. I was just holidaying the league before going to do a Melbourne City Beta save. I am doing another test now to see if its a similar result. Melbourne Victory's salary for their players is 4000 pounds over the maximum salary, meaning that not all their current squad can be registered. Melbourne City's salary is over the salary cap too (Even if De Laet is counted as a marquee). Brisbane Roar cannot register both Jamie Young and Brendan White under the cap. As said above Siem De Jong cannot be registered for Sydney FC under the cap, he is a designated player. Daniel De Silva is under the cap. 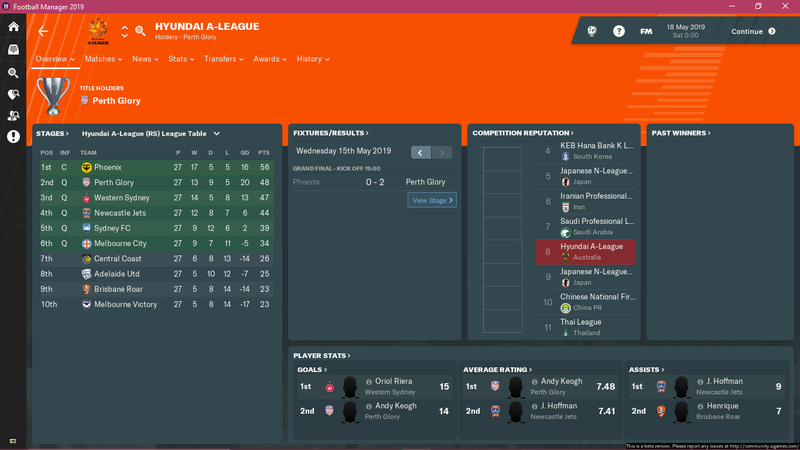 So pretty much half the A-League teams on FM cannot register their actual A-League team! So doing some quick calculations, it looks like that the salary cap per week is wrong. With 28,000 pounds per week, thats around $2.6M AUD a year. Referring to the salary cap system https://www.a-league.com.au/salary-cap-system thats actually the LEAST amount a club can spend on its club's salary, not the most. This is 30k pounds a week. That was for last season, we can assume that this season it would be more. Also, the minimum squad size of 15 players is wrong. The actual minimum squad size is 20 players. The Melbourne Victory NPL side is set up as a standalone club when it is essentially the youth side that play in the state league. That club is affliated with the A-League entity to enable 'loans' out to replicate what happens in real life. s a result most of Victory's youth players in FM are contracted to the NPL entity and not the main team, and the game acts as if the players need to be bought. Should start contracted to the main A-League side and possibly go up/down like how big Euro clubs do with their B sides that play in senior divisions below the main team's one. Tommy Oar should also be able to play AM L - he played there at the 2014 World Cup for Aus and would definitely be at minimum accomplished if not natural there. I can say that is definitely true as I tried to manage in Australia and couldn't manage the team going forward. Can we get anything from Si about all these issues??? New staff at Central Coast Mariners. https://www.a-league.com.au/news/mike-mulvey-finalises-mariners-football-department, Murray Leyland left in July. Charles Lokolingoy's contract seems a bit much. He is on a 1300 pounds per week deal. I've contacted our Head Researcher for Australia and asked him to advise on us on the reported issues. Thanks for all these posts guys, I am logging the requests to update all the issues that that needs to be addressed. The data lock for this database was a couple of days ago so some of the most recent transfers (e.g. Mandi, Akbari, Reuben Way) haven't been updated yet but have definitely been requested. As Kearyn Baccus is an Injury Replacement he won't be moved to Melbourne City as that will only cause more issues with Squad Registration as the game doesn't support that contract type yet. Idrus Abdulahi at Melbourne City is too young to be included in the game at this stage unfortunately. Injuries that have occurred after the start of pre-season, e.g. Trent Buhagiar, aren't included for the start of the game. Stadium names are set as their "Official" name, i.e. that name that would be used when they host an ACL or Asian Cup game. Not using the Sponsored Name is standard practice across the game (see Manchester City & Bournemouth's stadium names for example). Just a question on clubs NPL sides, as someone pointed out they aren't really separate entities, they are pretty much the academies for each club. They probably should be on the side panel as eg Melbourne City 2/Brisbane roar 2, at the very least players should be able to move freely from one entity to the other. Which is why I asked the question, the coach and squad members are in each 'club' in real life. As an extra, Dylan Pierias should be proficient at rb as well as lb (although rb preferred), also should be two footed. Just a question on clubs NPL sides, as someone pointed out they aren't really separate entities, they are pretty much the academies for each club. They probably should be on the side panel as eg Melnourne City 2, at the very least players should be able to move freely from one entity to the other. The reason it was separated is because the NPL competitions are unplayable leagues we can't set their season schedule to run at the time it does in real life. Countries are only able to have their Season Schedule set as Cross-Over (e.g. 2018/19 like the A-League) or Straight (e.g. 2018, 2019 like the NPLs) but not a combination of both for different competitions like Australia does. Since the NPL competitions would be running at the same time as the NYL & HAL seasons it would cause a pile-up of fixtures with players being selected for multiple games per week etc. Another issue is that some staff have one role with the HAL or NYL side and another role with the NPL side and that can't be properly implemented either. Is there a deadline by which you need to log these requests by? I can put some time in to go over things in detail (e.g. the NPL squads etc) but probably would be Thursday night AEST by the time I finish. Is there any sort of guidelines about recommending stat changes as well? IE is there a max range of attributes for A-League players or anything like that? Max CA/PA ranges? Thanks mate, it makes sense. I believe the cut-off is Wednesday UK time which is some time on Thursday in Australia. At this stage though, with the requests logged needing to be made centrally by the guys at SI for all countries in the database, we'd need to prioritise the issues that directly affect the A-League the most. That said, I do appreciate the help with NPL issues so if it can't get done I will make sure it gets done for the next data update. Just to also note, for any new players being added to the database we ideally want as a starting point: Name, Date or Year of Birth, Nationality/ies, Position/s. There's no real maximums or rigid criteria for CA/PA of A-League players & you try to call it as you see it but as a really rough guide a CA of between 90-105 is where a majority of A-League regulars would fit in but there's always exceptions to that. In Warren Joyce last press conference he was ahead of Daniel Arzani last year to start, but got a shoulder injury, so Arzani got the chance instead, if you want to compare a player.